As you know, I try not to write too much about the work I do, in an attempt to segregate my official duties from my blog. I will make an exception for once. When the earthquake stroke Haiti on January 12th, it not only devastated the poorest country in the Western hemisphere, but it also devastated our operations in Haiti. Our offices were destroyed. Our staff lost family and friends. Most of the country's infrastructure was affected, making it very difficult for any humanitarian aid to reach those in need. We set up our office in the Dominican Republic to provide the needed support both for our own organisation and for the other aid agencies. We set up a logistics "pipeline" receiving aid goods, coming in via air and sea, and transported them via air and road into Haiti. We set up an airbridge ferrying in the initial response goods, and humanitarian staff into Port-au-Prince and beyond. For the past months, I headed our operations, based in Santo Domingo. End of May, we are wrapping up the the initial emergency response phase. As the months went by, all organisations rebuilt their infrastructure, and the port, roads, warehousing capacity inside the country came back on its feet. Since a month, we have been converting our office from its initial response, to a more longer term configuration. We based our operations in two conference rooms of a hotel, here in Santo Domingo. No windows. The "dungeons" we called them, as they had no windows. Sunlight was a rarity in those early days. A month later, the hotel converted their "ping-pong room" near the swimming pool into a working space, with seven more offices normally used by beauty salons and travel agencies. The first few weeks were hectic. We worked from 7 am until late at night, 7 days per week, moving cargo and people into Haiti, processing finance and procurement transactions like there was no tomorrow. Staff rotated in and out, replacing the "initial responders" with "fresh blood", again called in from all over the world. We had people working with us, who are normally based in our operations in North Korea, Malawi, Dubai, Rome, all over Central and South America and Asia. Senior experienced professionals worked side by side with staff for whom this was their emergency operation, and local recruits. We dealt with government officials, nutritional experts, security incidents, commercial companies, airport authorities, immigration staff and transporters. 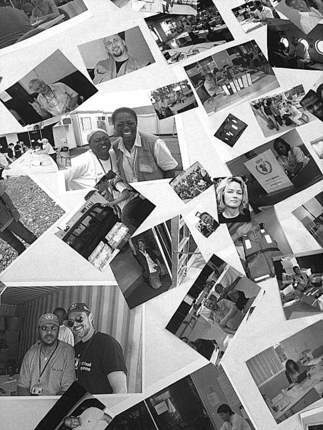 It was never a dull day for the -last count- over 170 different staff who worked in our Dominican operation. Now, four months later, we are "switching off the lights". As of June 1, we have demobilized most of the international support staff, handing over the operations to the local staff we recruited, with just a few expat staff remaining. The initial response phase is over. Organising a new office has its challenges. Making sure all operations go smooth, fast and auditable. Ensuring all the pieces of the supply chain match together. Building up a team, even with that many people coming in and out. Dealing with sudden 'emergencies': our staff in Haiti running out of food supplies, pockets of displaced people appearing along the border in need of assistance, one of our staff being shot at, to manually stamping 500,000 food distribution coupons. But building something, a team, an operation, is fun. That is what I like. Downscaling -although an intrinsic part of any good aid operation- is more difficult. Not only ensuring all the last bits and pieces of the operation are properly closed, suppliers are paid, all contracts are well documented, etc... but the personal aspect, is often a challenge... "Switching off the lights". It has been an interesting experience within myself. I had to downscale something I built. In the past four weeks, gradually people have gone back to the duty station they were called from. There have been many goodbyes. And I am not good at goodbye's. We had many beautiful people working with us. Professional in their job, and really nice individuals. Some of them have worked in this operation since the beginning. And now, it is time to leave. Time to close what we have worked on. "our project", "our office", "our team". Over the past months, I have gotten to love the people I work with. Working in any emergency creates that bond, the feeling of "us". And saying goodbye, especially to those who were here since the beginning, is not easy. Sure enough, we are all professional aidworkers. This is our job. But we are also human. We are not only saying goodbye to colleagues, but we are also saying goodbye to people who have become close friends. People who we have shared a unique experience with. People who we have shared these incredible four months with. As we walk in this road of life, we cross many people and we create many bonds. The bond between emergency responders is unique. We hold together. Together against the challenges of time, the challenge of the enormous needs, the challenges of.. "the outside world". We live and work together, not thinking of "tomorrow", but dealing with the issues of "today". And now, we will all go our own way. Back to France, Italy, Panama, Ivory Coast... Many of us, in thoughts. A piece of us will remain here, in Santo Domingo. Cradled in memories of those crazy nights stamping those damned coupons. Of the time where we had to get a ton of food for our own staff on the plane in three hours. Of the time where we had to get that much needed aid cargo at the border in 24 hours. Once upon a time, we will all meet again. In another emergency. When I meet Georges next time in flood operation somewhere in Asia, or Alex in a civil war somewhere in Africa, or Henrik in a drought operation in the Caucasus, we will meet again as old friends. As if we never parted. Sharing the memories of this operation. Sharing the bond. But for the time being, we have to go. We part. We say goodbye. Knowing there is never enough we can express at the moment when we give that final handshake: "Thank you for your help, it was a pleasure working with you", while we really wanted to say is "You know, I loved working with you. You are now part of my heart. Thank you for being part of this". So for all of you, this is not goodbye. But "I will see you again". You are in my heart. We did well. We made a difference! I've worked with you in several occasions. And today, I was sitting here wondering what am I really doing this (aid work) for. I got nostalgic and I thought, "I wanted to get a feel for what Peter is doing" and found this message. As per usual, it truly inspires me.. Fills me in with hope again and more. On top of that, I think it necessary to give something back from those that have worked with you.. To me, you're the ideal manager that I hold up all others to.. I know it is not what you intend at all. Paths are followed, people learn lessons etc etc. The world definitely needs help but you can;t do it alone and when aid workers are in danger of being killed and imprisoned.... I think there is a limit. Places such as these need more than aid workers. What is heartbreaking is hearing stories where people come in and help people and then terrorists come in and hack them to pieces. Terrible sickening stories to hear. Religion is not a good enough reason. Tomorrow Gamma rays will come in from a far off star, destroy the ozone layer and make toast of everyone.So what was the point of it all? look at me! look at me! look at me! look at me! look at me! look at me! look at me! look at me! look at me! look at me! look at me! look at me! look at me! look at me! look at me! look at me! look at me! look at me! look at me! look at me! look at me! look at me! look at me! look at me! look at me! look at me! look at me! look at me! look at me! look at me! look at me! look at me! look at me! look at me! look at me! look at me! look at me! look at me! look at me! look at me! look at me! look at me! look at me! look at me! look at me! look at me! look at me! look at me! look at me! look at me! look at me! look at me! look at me! look at me! look at me! look at me! look at me! look at me! look at me! look at me! look at me! look at me! look at me! look at me! look at me! look at me! look at me! look at me! look at me! look at me! look at me! look at me! look at me! look at me! look at me! look at me! look at me! look at me! look at me! look at me! look at me! look at me! look at me! look at me! look at me! look at me! look at me! look at me! look at me! look at me! look at me! look at me! look at me! look at me! look at me! look at me! look at me! look at me! look at me! look at me! look at me! look at me! look at me! look at me! look at me! look at me! look at me! look at me! look at me! look at me! look at me! look at me! look at me! look at me! look at me! look at me! look at me! look at me! look at me! look at me! look at me! look at me! look at me! look at me! look at me! look at me! look at me! look at me! look at me! look at me! look at me! look at me! look at me! look at me! look at me! look at me! look at me! look at me! look at me! look at me! look at me! look at me! look at me! look at me! look at me! look at me! look at me! look at me! look at me! look at me! look at me! look at me! look at me! look at me! look at me! look at me! look at me! look at me! look at me! look at me! look at me! look at me! look at me! look at me! look at me! look at me! look at me! look at me! look at me! look at me! look at me! look at me! look at me! look at me! look at me! look at me! look at me! look at me! look at me! look at me! look at me! look at me! look at me! look at me! look at me! look at me! look at me! look at me! look at me! look at me! look at me! look at me! look at me! look at me! look at me! look at me! look at me! look at me! look at me! look at me! look at me! look at me! look at me! look at me! look at me! look at me! look at me! look at me! look at me! look at me! look at me! look at me! look at me! look at me! look at me! look at me! look at me! look at me! look at me! look at me! look at me! look at me! look at me! look at me! look at me! look at me! look at me! look at me! look at me! look at me! look at me! look at me! look at me! look at me! look at me! look at me! look at me! look at me! look at me! look at me! look at me! look at me! look at me! look at me! look at me! look at me! look at me! look at me! look at me! look at me! look at me! look at me! look at me! look at me! look at me! look at me! look at me! look at me! look at me! look at me! look at me! look at me! look at me! I am!! but don't see anything!